I look forward to our annual road trip, a chance to drive through parts of America that we usually see only from the window of an airplane. Recently we headed from Austin to the mid-Atlantic coast with stops along the way at beautiful Southern gardens and a handful of golf courses (read more in future posts). Torrential rains from a tropical depression made driving through Houston more challenging than normal, but by the time we reached Beaumont, the rains had subsided. When we crossed the Louisiana border, it was lunch time, so we picnicked at the state welcome center, a lovely spot on a lake that probably flows into the Sabine River at some point. 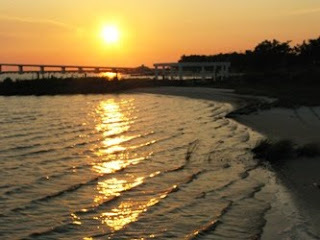 We stopped for the night in a hotel just off Interstate 10 near Biloxi. Following the advice of the check-in lady, we headed to Aunt Jenny’s Catfish Restaurant in adjacent Ocean Springs for dinner. A crock of creamy coleslaw was quickly set on the table, with the promise of homemade biscuits—as soon as they were out of the oven. Larry and I shared the large catfish and shrimp dinner, which was plenty for both of us. Still daylight, so we drove a short distance to Front Beach, a spot totally decimated by Hurricane Katrina five years ago. A wide paved path follows the beach for several miles, making a perfect place to walk without getting sand in your shoes. 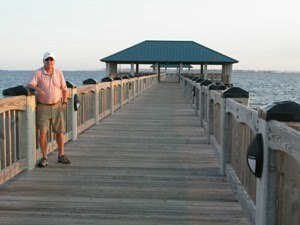 We parked near the Ocean Springs Yacht Club at the north end and walked to the Chester McPhearson, Jr. Pier, a recent addition to the beach scene. It proved to be an excellent place to watch the setting sun, a huge red-yellow ball gleaming in the cloudless sky. A local jogger told us that the land was leveled during Katrina, and the lovely ocean front homes we saw perched on hills are the result of new dirt brought in to build up the area. Seems to me that homeowners are still risking destruction from future storms. After our walk we drove toward the south end of Front Beach to Harbor Landing Yacht Club and then headed back to our hotel on Washington Avenue, the main street, past the Chamber of Commerce Welcome Center which housed in a converted train depot. Overall, we found Ocean Springs a pleasant place to enjoy the Gulf of Mexico, and so far the shores are free of tar. Love the picture at the top - so free and fun.